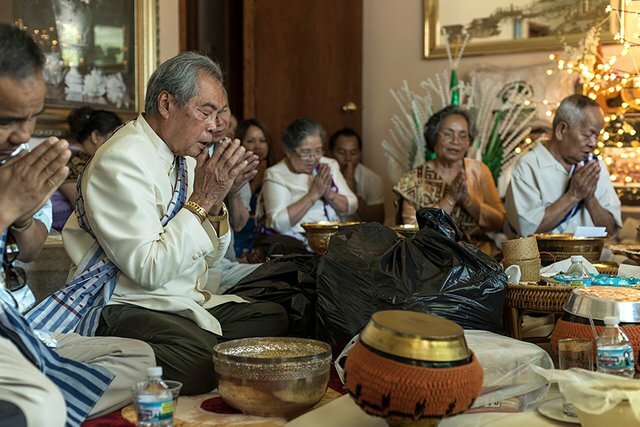 Traditional Lao celebration of life ceremony w/ @vermillionfox's family! Hey, Steemit! It’s been a crazy week in preparation for a family trip to Iola, WI to meet @wcpublishing for the Car Show, and then a continued journey straight through to the east coast to visit @bonni, @customnature, @bryan-imhoff and hopefully […fingers crossed], @drwatson and @la-fumettista. My last day in Minnesota for a while, I’m helping get @kismetart set up to make his introduction post here at @caffetto. Good vibes to get us through this crypto-desert to the awaiting, prosperous oasis that is sure to come. Speaking of good vibes, I have some very personal photos I’m excited to share today. One of my favorite things here on Steemit is getting glimpses in to places and cultures far beyond my daily life. @slowwalker’s walks through Korea are some of my favorites. @herbaliblog’s lifestyle in Indonesia is tranquil. @eveuncovered’s homeland of Finland and her travels have become a conduit for the places I’d love to go and see. My brother @customnature has accumulated an impressive passport of stamps over the years. 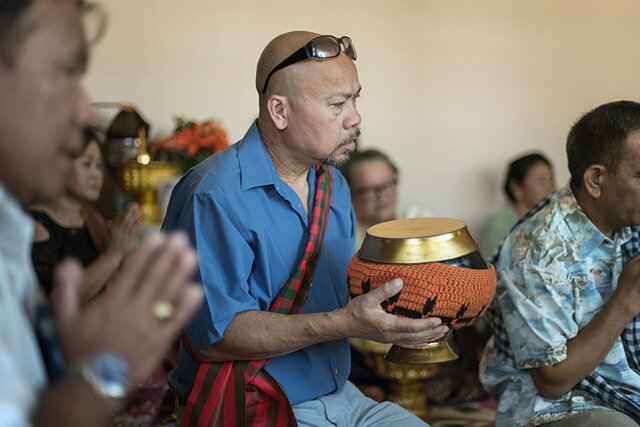 This past weekend, I had the chance to experience a new culture close to home, in my own family. @vermillionfox and I have been sweethearts for years but the times she’s gone to temple, I’ve always been out of town working. During the first week of July, we’ve all been looking for her Su kwan celebration of life. I really do adore @vermillionfox’s grandmother and in turn, she adores @guthrie. She’s been kind to us since I was first introduced to the family. For weeks, preparations were made for this event. @vermillionfox will most likely do a deeper summary of the festival. @guthrie and I arrived Saturday night for food and to spend time with friends. It was late, so we weren’t able to stay long, but the real celebration was happening the next morning. Sunday, we arrived at 9:00a.m. in our best clothes. @vermillionfox was inundated with work and food preparation. 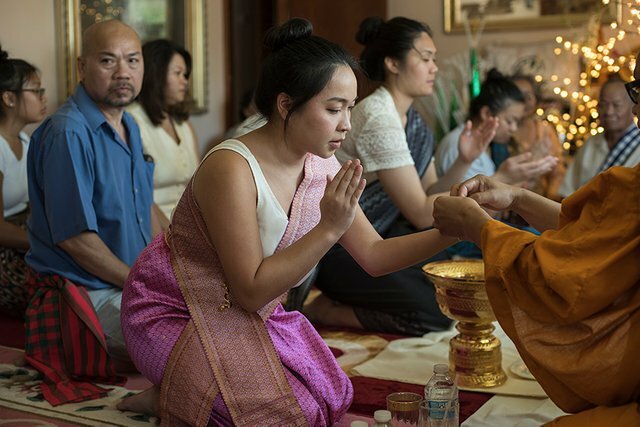 The monks from the Lao temple arrived shortly after us and the family was gathering in the living room. The children were downstairs and by 10:00a.m., the ceremony had begun. I took my place near the monks with my Nikon D750. I tried to be quiet and respectful as @vermillionfox’s uncles and grandfather prayed. The monks and elders would exchange prayers and verses on life. 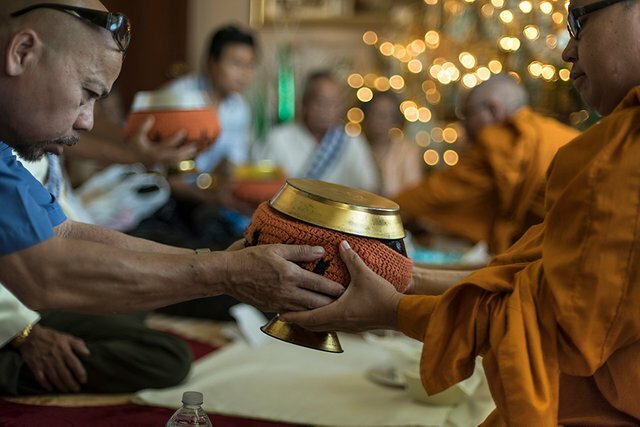 An offering was made to the monks in food and money. Once the monks ate, the rest of the family was allowed to gather and eat lunch. There was a variety of traditionally Lao foods. @guthrie and I stayed on the conservative side with sticky rice and homemade beef jerky. After lunch, we gathering back in the living room. The monks lead in the blessing of water. 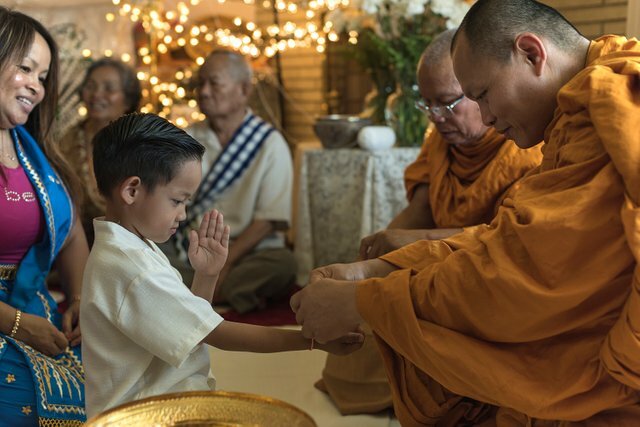 Once the water was blessed, the oldest monk dipped a wooden roll in to the cups and shook water on the heads of the family members gathered before them. 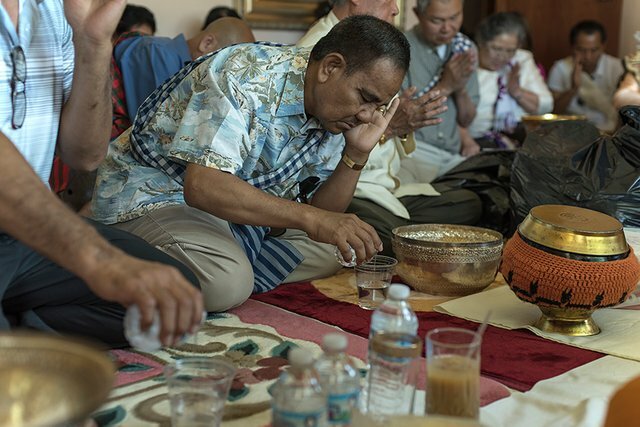 After final prayer, the family members and children got in line to receive blessings in the form of small bracelets. One by one we kneeled for this prayer of luck and good fortune; the monk tired them around our wrist and we bowed three times before thanking them and leaving. Thanks for reading. This was a rich experience and I loved having something in my family that contrasted my own culture, especially for @guthrie who was able to experience this tradition at such a young, impressionable age. For more photography, art, illustration and life experiences, follow me here @kommienezuspadt! This totally reminds me of my time in Luang Prabang Laos almost a year ago now. Very religious Buddhist place. Offers such a great peaceful environment. Luang Prabang and being around the culture of the monks was surely the highlight of my trip in Laos. So glad I stopped by your page today. Time has been a major constraint as I've been marching east through Europe. But I plan on slowing my roll in this fantastic Pay Less Get More Country. From Kiev Ukraine! -Dan "World Travel Pro!" I'm envious of your travels @world-travel-pro, but then again, I'm not, lol. I'm fortunate to get to travel so much because of my job but it often keeps me away from @vermillionfox and @guthrie and a lot of the time, it's a bummer. Right now we're all on a big trip throughout the east coast. We're here for about 10 days, then we go back to Minnesota for three days. After that, flying to LA for a week, then driving to Vegas for a week. We get home right before @guthrie starts school. It's going to be a crazy few weeks but at least they get to come with me. Maybe one day when STEEM moons, the three of us can go to Laos and take in more of the culture together. Sorry it took me a while to get back to you. With your work, family, and all that you have going on I can see why travel in general is such a burden. Like seriously, that is one difficult schedule that you just laid out while balancing work and family, crazy few weeks indeed. But I've got a feeling you always make the most of it and in fact I'm sure you are having a great time doing so. As for me, I'm loving Kiev Ukraine, there would certainly be no shortage of beautiful models here for any photo shoot you can dream up. I've never seen any place like it. It's just gorgeous blonds on parade everywhere you go! Read of so many cultures and think that ours is tiny. I liked the part of the monks only of them the part of Kun Fu, no offense has offended is what happens in the movies. Very nutritious article thanks for sharing. I'm from a different culture but as I've traveled a lot I have made some international friends. New cultural experiences are always fascinating. I agree with you @kommiezuspadt, I think what @slowwalker is doing is really good every time I enjoy reading his publications I have learned so much from so many inexplicable things that they did many years ago and you do not know how or who but exist there and you can have the opportunity to know that that exists thanks to people like him, I did not know at all about the culture of Korea until I met him I can see each of his publications and learn every time or know places which would be impossible for me to visit. @customnature has a beautiful photos of many places and I enjoy seeing, in your family are all photographers? but more incredible it is to be able to live an experience being there in the place, to be with a person who does not have your customs and traditions and to be able to share with her that moment unites them more as a couple. Customs and traditions is what identifies us as a person and whether we are in our country or elsewhere always accompany us. Thanks @yanes94! @customnature and I both have a strong artist DNA in our family. I think from our grandfather. You should start doing some posts on the culture of Venezuela. I see a lot of the bad, but I'd love to learn more about the food, people and past times. The culture of Venezuela? Hmmm well, @kommienezuspadt I can tell you that the food is delicious😍 ! The truth is that I think Venezuela is very beautiful and has a lot to show but unfortunately in social networks you only see what is bad, negative and politics that opaque what Venezuela has, beautiful places 😍 and people who are nice despite the times we live , I would love to show the world a bit of my country, but at this moment for me it is very difficult, for the economic and security issue! This looks like such an amazing experience. I am always so fascinated by all the various ways people worship and share their beliefs and expression to their various deity/deities/sprituality. It's wonderful that they were ok with your photographing it as well. Yeah, @donnadavisart. I was a little apprehensive about taking pictures but @vermillionfox assured me that they wanted nice photos from the celebration. HA! That's great that you've been reading her posts. She made two along the way driving from Minneapolis to Pennsylvania. Thank you @paradise.ati! I appreciate the nice comment. This is beautiful and to be cherished. Traditions are important pieces of our family structures. Thank you for sharing this friend! Of course @artedellavita! Thank you for reading. It was a very rich experience. The festival fell during a very stressful time with travel and work commitments, but once the celebration began, I was completely immersed in the beauty. @vermillionfox's grandma is wonderful and I loved seeing her so happy. I'm glad I was able to help document it all. Hoping we all get to see you on the west coast next month. Thanks for reading @mgaby. I appreciate the comment.